Back in the fall of 2016, Maureen’s Green Mountain Flyer Tunic was published in a terrific collection of sweater dresses entitled All Aboard! A total of 6 talented designers collaborated on this electronic anthology and their patterns inspired a more than a few of us to reconsider knitted dresses and tunics. These patterns bring a contemporary spin to garments that some have wrongly relegated as a thing of the past. Thanks to the many clever details in Maureen’s pattern, you no longer need to have a 1950’s pin-up figure to pull off a knitted dress. And now, this pattern is available for individual purchase! 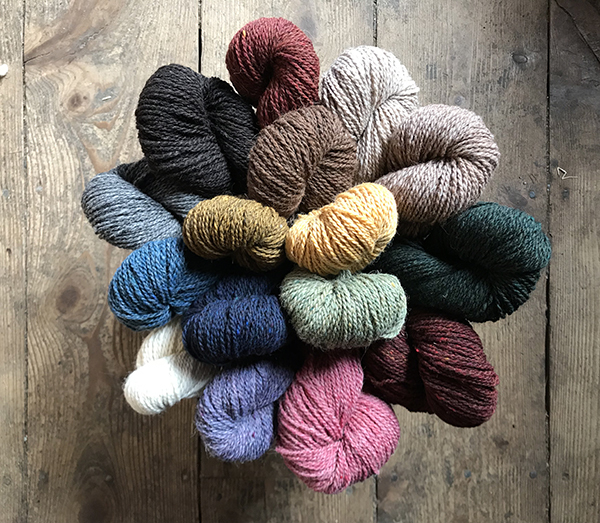 This garment is created with between 7 and 9 skeins of Spinnery Alpaca Elegance for sizes ranging from 30 (34, 38, 42, 46, 50)” / 76 (86, 96.5, 106.5, 117, 127) cm. 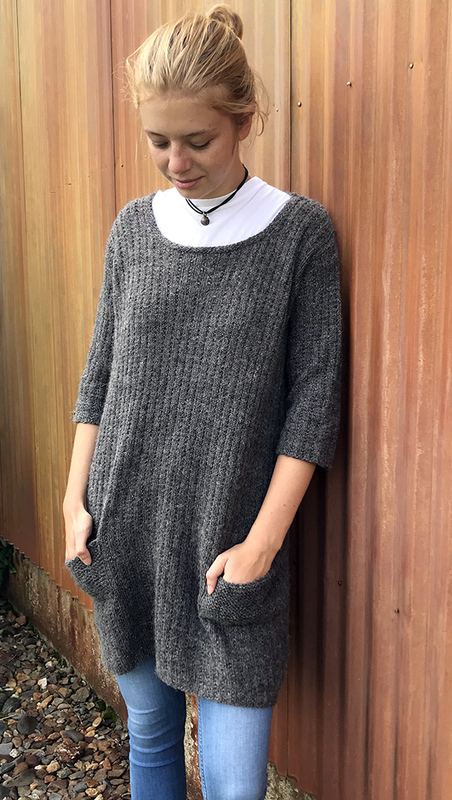 Thanks to that 50/50 blend of wool and alpaca fiber, the simply created k2, p1 rib fabric has some fluid movement that is perfect for oversized garments. It prevents the dress from becoming stiff and unappealingly boxy on the body. Subtle A-line shaping and a generous scoop neck also add to the design’s appeal. 3/4 length sleeves draw the eye to the waistline and keep the overall garment silhouette from becoming too long. Plus, we can’t resist drawing your attention to the little garter stitch patch pockets. Darling, right? Paired with a great pair of boots and warm tights, this dress could perform double duty. The subtle heathered shades of Alpaca Elegance will create a versatile garment that will suit almost any occasion. With the beginning of September marking the start pumpkin spice season, a return to school and the eventual return of sweater weather; it’s a perfect time to consider casting on for this project. Perhaps this year your Rhinebeck sweater will instead be a Rhinebeck dress?